The legendary guitar tones produced by Marshall amplifiers can be yours for a knock-down price of only $19 right now during Guitar Month. Drive – Adds more distortion drive. Bass – Adds less or more low frequencies. Middle – Adds less or more middle frequencies. Treble – Adds less or more high frequencies. Selector BTN – Off (bypassed), Off Axis mic or On Axis mic for speaker emulation. In – Controls the input level of the plug-in. Out – Controls the output level of the plug-in. 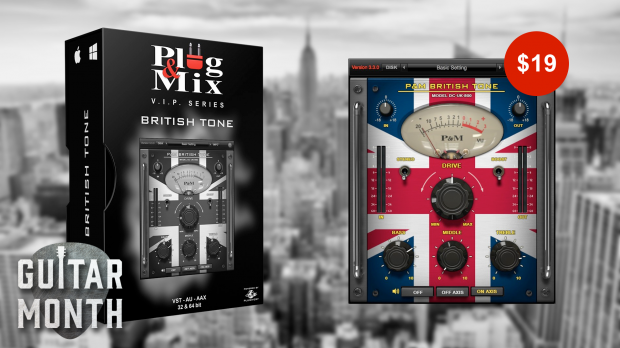 This entry was posted in DontCrack, Plug & Mix, Plug-ins, Promotions and tagged British Tone, distortion drive, guitar amp plug-in, guitar preamp, Marshall amplifiers, Plug & Mix, Plug and Mix, Speaker Emulation. Bookmark the permalink.